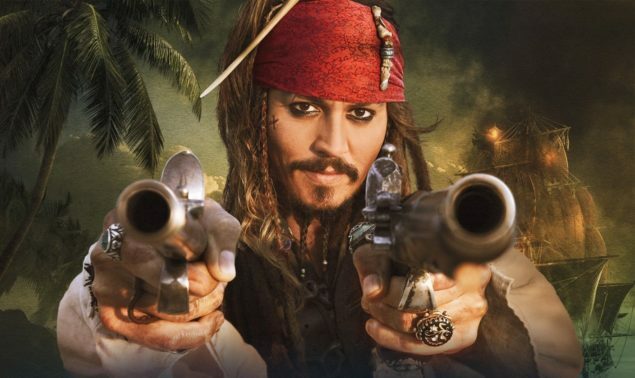 Pirates of the Caribbean: Dead Men Tell No Tales has officially began production and Walt Disney Studios has released a plot synopsis for the film. Johnny Depp returns to his Academy Award-nominated role as Captain Jack Sparrow, joined by Oscar winner Javier Bardem (No Country for Old Men, Skyfall), newcomers Kaya Scodelario (The Maze Runner, “Skins”) and Brenton Thwaites (Maleficent, The Giver), and Golshifteh Farahani (The Patience Stone, Exodus: Gods and Kings). Returning cast members include, Academy Award winner Geoffrey Rush as Barbossa, Kevin R. McNally as Joshamee Gibbs and Stephen Graham as Scrum. Joining Bruckheimer, Sandberg & Rønning for the new adventure is a first-tier group of award-winning behind-the-scenes artists — many of them new to the Pirates of the Caribbean family — including director of photography Paul Cameron (Gone in Sixty Seconds, Collateral), production designer Nigel Phelps (Pearl Harbor, Transformers: Revenge of the Fallen), costume designer Penny Rose (all four Pirates of the Caribbean films), visual effects supervisor Gary Brozenich (The Lone Ranger, Edge of Tomorrow), Oscar-winning special effects production consultant John Frazier (nine Jerry Bruckheimer films and dozens of others) and special effects supervisor Dan Oliver (Mad Max: Fury Road, X-Men Origins: Wolverine), supervising stunt coordinator R.A. Rondell (The Hunger Games: Mockingjay – Part 1) and stunt coordinators Thomas Robinson Harper (Guardians of the Galaxy, Captain America: The Winter Soldier) and Kyle Gardiner (San Andreas, Kingsman: The Secret Service), Academy Award-winning makeup and hair designer Peter Swords King (The Lord of the Rings and The Hobbit trilogies, Into the Woods) and film editors Joel Cox (Unforgiven, American Sniper) and Gary D. Roach (American Sniper). Walt Disney Studios has several other projects in the pipeline, including McFarland, USA (Feb. 20, 2015); Cinderella (March 13, 2015); Monkey Kingdom (Apr. 17, 2015); Tomorrowland (May 22, 2015); Inside Out (June 19, 2015); The Good Dinosaur (Nov. 25, 2015); Star Wars: The Force Awakens (Dec. 18, 2015); Zooptopia (March 4, 2016); The Jungle Book (Apr. 16, 2016); Finding Dory (June 17, 2016); and Moana (Nov. 23, 2016). Meanwhile, Marvel Studios will release Avengers: Age of Ultron on May 1, 2015, and Ant-Man on July 31, 2015. Its other movies, scheduled for release through 2019, are not in production.